Usually the CWRU Film Society makes overpriced college tuition a little bit closer to worthwhile with its semester-long season of film screenings, including new releases and classic revivals. Here they are planning to make those crushing student loan debts in the no-jobs economy a less painful memory, at least for an hour or two, with an outdoor, free exhibition of a hit comedy that brought a number of smiles to the Iraq invasion-stained year of 2004. It was NAPOLEON DYNAMITE. Which, for those with minimal memories of the era except for Bush-supporter death threats against the Dixie Chicks, was a little PG-rated comedy, largely shot and acted by Mormons from Brigham Young University, and written and directed by 24-year-old Jared Hess with his wife Jerusha. 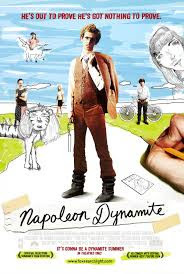 Shot in Preston, Idaho, the filmmaker's hometown, NAPOLEON DYNAMITE was a surprise attraction at comedy festivals and got a high-profile, immensely profitable release masterminded by Fox, Paramount and MTV Films. (Maybe if those same organizations partnered on the disastrous Iraq invasion and/or Mitt Romney’s presidential campaign, the world would be a less lousier place right now. Well, no, probably not). The movie itself is an easygoing, likeable farce that lived up to its hype by underplaying, in a drop-deadpan funny formula of awkward, uncharismatic teens rising above expectations in boondocks USA. Short's Ed Grimley. Much of the time he’s likely to stand in stunned, inarticulate silence at the weird hands life has dealt him. If Napoleon suffers by occupying the lowest rung of the social scale in high school, he doesn't whine about it, and he meets life's vissitudes - like living with a 32-year-old Internet-nerd brother Kip (Aaron Ruell) under their grandmother's roof - with goony-adolescent stoicism, a constant open-mouthed stare, a talent for drawing badly but imaginatively, and the occasional off-note exclamation of "dang!" or "sweet!" (or "what the flip?!" to keep everything Salt Lake City-clean). type trying pathetically to raise college money. When Pedro gets in over his head in a class election and Deb receives sleazy suitor attention, Napoleon's "skills" (or serendipity, or dumb luck, in various combos) unexpectedly help out. Quotable lines centered on Tater Tots and the romantic “I caught you a nice bass!” A ready-made fan club, abundant preview screenings and catchphrase T-shirts (“Vote for Pedro”) managed to finesse NAPOLEON DYNAMITE into a “cult” sensation before it opened. Pretty much a textbook case in sly marketing, though at least the product was worthwhile, and I like to think that some of the millions of young moviegoers who went to NAPOLEON DYNAMITE for the laffs were able to similarly appreciate the somewhat similar deadpan comedic stylings of Wes Anderson, Akron’s Jim Jarmush or Finland’s Aki Kaurasmaki (yes, I’m sure those kids all did that, yeah right). Alas, the filmmakers’ later attempts to make a successful encore just haven’t happened. A recent short-lived TV-cartoon adaptation of NAPOLEON DYNAMITE, even with the cast gamely reunited, just seemed like milking the cow once too often. Some critics at the time thought the movie’s portrayal of high-school life was reminiscent of the bitter WELCOME TO THE DOLLHOUSE, but more soft-edged. Maybe even too soft-edged for some tastes (most of us movie reviewers having had nowhere near the good time in class Napoleon does). I’ll tell you what killed this film’s innocence for me, though; when local cartoonist Derf Backderf published his My Friend Dahmer, a graphic-novel-esque memoir of his high-school classmate Jeffrey Dahmer in 1970s Ohio. The future Milwaukee serial killer comes across as very much a Napoleon Dynamite-type indeed. Only you know that his story will turn out very differently.